The PFD and MFD are essentially the same however they have each been loaded and pre-set with their own firmware so that they control the correct module in X-Plane. If you should want to change this please contact us for instructions. 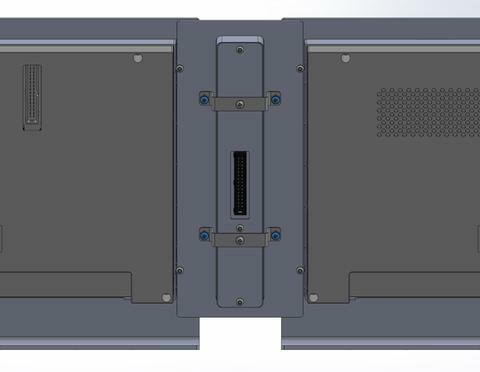 If you are mounting the G1000 suite in your own panel, please see our panel cutout guide for details on the required panel cut out shapes. The PFD and MFD are mounted using x4 M3 self tapping screws, inserted from the rear of the panel. You may substitute a #4 or #5 screw if you do not have M3 screws available. 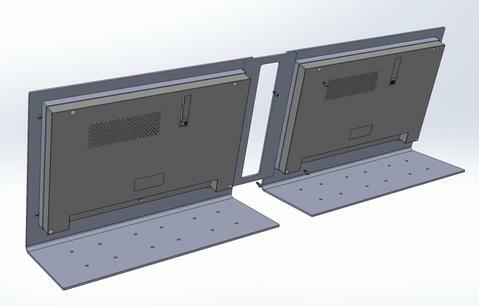 If you purchased the optional G1000 Suite Desktop Stand the PFD, MFD and audio panel fit into the provided cut outs. To assemble the stand, position the audio panel bracket between the two PFD/MFD brackets, then add the mounting screws after the PFD/MFD module is installed. Next, install the Audio Panel. Remove the mounting brackets, insert into the Audio Panel cut out then replace the brackets. Adjust the provided screws to tighten in place. Next, connect the USB cables. There are x2 USB cables for each of the PFD and MFD. 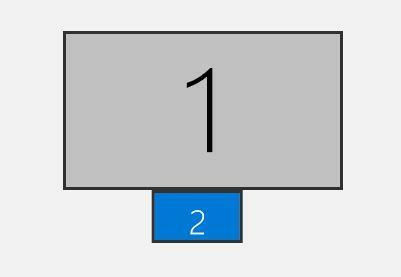 Also connect each unit to the PC display output using the provided HDMI right angle adapters. You do not need to connect directly to a HDMI port on your PC, you can use any available DisplayPort or DVI to HDMI adapter or cable. Also connect each unit to power using the provided 12v power packs. Download and install the RealSimGear plugin for your flight simulation software. In Windows, open Display Settings and change the display setting for the smaller display to “Landscape / flipped”, set the resolution to whatever Windows says is recommended. It is usually best to 'place' the additional displays below and to the center of your primary display. This makes it easy to adjust the G1000 screens to exactly fill the display however if you have multiple other displays, this positioning may need to be modified. To override the default G1000 PFD and MFD bezel graphics, download the following files (right click, save as) and place them into the following folder. Start X-Plane and load the default Cessna 172SP G1000. With the default 3D cockpit view selected, click on each of the PFD and MFD screens so that they ‘pops out’. Look for the small rectangle in the upper right and click this to make the window appear with the white bar at the top. Now position the window so that it fully fills the G1000 screen. If you position the G1000 display below your primary display, just drag it down so the only the white bar is visible in your primary display. You may need to adjust the width/height of the popped out window slightly. Try pressing the buttons on the G1000 and you should see the screen change. If you don’t see anything changing, you can check that the G1000 is connected by checking the connection status window in "Plugins -> RealSimGear GNSx30 -> Connected Hardware". Your device should appear in this window, and the message/command items will change when you press the buttons or turn the knobs. Not working or further questions? Please take a look at these additional trouble shooting steps.